Questioning our identity and traditional power relations. About Hatoum's exhibition "Hot Spot". Exile or home? Controlled or control? Captive or free? These clashing uncertainties are the art of Mona Hatoum. The Berlin- and London-based artist never ceases to surprise us, unearthing the pleasure in the pain, the strange in the familiar, the presence in the absence. For her first show in London since 2002, we are again invited to question our identity and traditional power relations. Placing the viewer in often unsettling environments, Hatoum’s work - spanning performance, video, sculpture and installation - serves as a constant reminder of Western complacency. 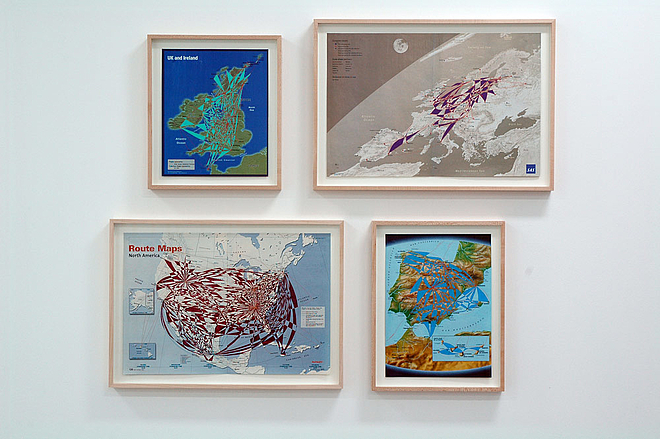 Maps and globes challenge conventional perceptions of the world. Consistent with the Peters Map, "Projection" (2006) displays lands in true proportions rather than the familiar enlargement of Western Europe and North America. The delicate outlines of the handmade paper, where bodies of water are embossed, underscore the fragility and fleeting quality of man-made productions and hence, of the human condition itself. In this "projection into the future," entire continents seem to sink into seas and oceans rather than rise above them. Meanwhile, "Hot Spot" (2006) is both threatening and inviting - the thin red neons of the continents’ outlines draw close until the intense heat makes us aware of an imminent danger. The cage-like quality of the piece may also seem hostile to some - the globe is big enough to engulf a man. Conflict is not limited to distant lands. Rather, the whole world is a "hot spot." The relentless buzz of electric tubes and fuses warns us of alarmingly high voltage. An aesthetically pleasing experience becomes one of potential danger. For "Cube" (2006), also part of the new works presented at White Cube gallery, Hatoum takes up one her favorite themes - cages. These, and grids in general, have been part of her work over the past decade. Here again, she pushes the boundaries of the cage so that it becomes both a reassuring arrangement system and a cold, almost brutal control device. Indeed, the wrought iron cage has no exits and stands 174cm tall, again large enough to fit a man. Subversion is a familiar practice for Hatoum. Her Carpet series (1995) makes uncertain the ground on which we tread. "Prayer Mat", created for the 1995 Istanbul Biennial, is another example of her "attracting/repelling" objects. Made from nickel-plated brass pins, this mat is not one on which to prostrate. Yet the carpet’s shiny pins simultaneously evoke the cosmos. While spelling out "Welcome," "Doormat II" (2000-2001) is anything but - its bristles feature thousands of steel pins. Home is no longer a safe haven but a dangerous place. Displacement, denial and otherness are all too familiar to Hatoum, born in Lebanon to Palestinian Christian parents, speaking Arabic and French at home and in school, exiled in London after the Lebanese civil war broke out in 1975. That war lasted 20 years. Even during her youth in Lebanon, Hatoum was a stranger in a strange land and never felt at home, much like other Palestinian refugees in the land of cedars. Yet Hatoum rarely refers explicitly to her background, such as in "A Thousand Bullets for a Stone" (1988) on the first Palestinian Intifada, and "Measures of Distance" (1996), which relates the artist’s conversations and correspondence with her mother. The latter piece, where a projection of her mother under the shower is overlaid with Arabic lettering, also explores power relations between the West and the developing world. Hatoum thus infuses the personal into history, countering traditional representations of the developing world by the West - rather than limiting views of the developing world to situations of despair, drama, exaggeration and collectivity, she deconstructs power and highlights the individual. Notions of exile also echo those of discomfort in a faceless consumerist society. We are caught in a frozen limbo between abstraction and representation, between personal and external projections of the self. Hatoum forces us to reconsider the looming mutual uneasiness of different cultures, most importantly of the West for African, Asian and Muslim cultures. Hatoum, whose formal art education took place at the Byam Shaw and Slade schools of art in London, highlights her own ability as an exile to view objects in a cold, detached way. As an outsider - real or imaginary - she, and in turn the viewer, can discover hidden qualities of objects that have become too familiar to others. Stepping away from a Hatoum installation can give an unsettling sense of the déjà-vu, with a lingering aftertaste all too different from usual representations. When the AIDS crisis came to global attention in the 80s, Hatoum saw a revelation of the human body’s vulnerability. The sense of danger or disquiet present in much of her work since then has repeatedly, albeit subtly, underscored human fragility. Even when absent, the body is almost always evoked. In her earlier work, largely concerned with performance outside the gallery and art establishment, the body was far more present, underscored by an explicit narrative on such themes as race and sexual identity. In "Don’t Smile, You’re on Camera" (1980), she turned the camera onto the audience. The projection contained additional unclad body parts; the result: shocking gender bending and a trespassing of social constructs. In a wink to the constant surveillance we experience today, the artist literally invaded people’s boundaries. Questions of power and identity as they relate to the body were a central part of Hatoum’s work throughout the 80s and 90s, perhaps best epitomized by "Corps Etranger" (1994), an endoscopic voyage through the orifices of the artist’s body that earned her a nomination for the 1995 Turner Prize. First created for the Centre Pompidou in Paris, this disquieting journey taken while leaning over a circular video screen, is first accompanied by breathing on the outside where we are confronted with grossly enlarged hair, teeth and pupils, then by the sound of a beating heart as we enter the pulsating tunnels of the human body. Narrative became more subdued in her later work as Hatoum adopted a minimalist approach, paving the way for not a single narrative but many narratives. We are invited to experience sculptures with both mind and body, eliciting the same emotion and physical tension as Bill Viola’s videos. Whether you take a trip down Hatoum’s esophagus or through the intricate blown crystal Web (2006), it is a liberating journey of discovery through introspection. Journalist and art critic, based in Washington, DC, USA. Producer at the Washington Bureau of NHK (Japan Broadcasting Corporation). Born in Paris, France. Articles about the artist, informative photo tours through some exhibitions, and her works in different areas of Universes in Universe - Worlds of Art.